Tomatoes (Lycopersicon esculentum) are too delicious and too easy to grow not to mention them. These nightshade (Solanaceae) are like the potato brought by the Spaniards from Mesoamerica. The plant is also slightly toxic by tomatine. This glycoalkaloid is a toxic substance that serves as a defense against multiple diseases. The green berries, which are being used in chutney, are poisonous. When ripening the toxicity disappears. Originally ripe tomatoes were yellow. The leaves have hairs with glands that spread the typical tomato odor on contact. Tomato was first been cultivated as ornamental plant, pomme d' amour (apple of love). Mid 19th century it was an aphrodisiac, and now is the fruit rather seen as a vegetable (or fruit). It is a perennial, creeping plant that can be grown on any soil as an annual. It exists in many types, shapes and colors. Sowing can at + 20 (22-25)°C, on the windowsill, planting you do if they have some true leaves (not the two cotyledons). Cultivated plants are put in the greenhouse in early April to the end of May. Tomato is sensitive to frost. Tomato want a night temperature that does not drop below 12°C. You can use covers, or keep them in a greenhouse. Give enough (hot, 20°C) water, and during growth also some solved fertilizer. With less water they remain smaller and tastier. Tomatoes for sale are picked when they are still firm and not ripe. The taste cannot match the bush matured colleagues. Support the plant with poles or ropes where you can spiral them around. The first shoots you take away can be put in water to root. 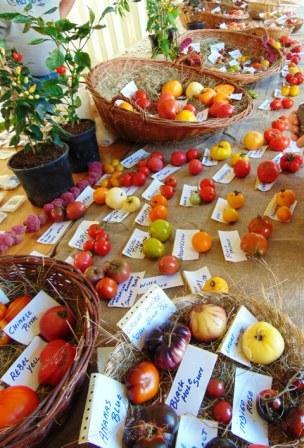 Tomatoes have the ability to develop roots on each place of the stem. You can leave some shoots and lead the plant fan-shaped. Limit the number of bunches per plant. Keep out 3-4, in the greenhouse 6 to 9 bunches. Cut out the growing point above the upper racime around 10 / 08, then the fruits have still time to mature. They need light, but not too much straight sunlight, heat is needed. I prune all the leaves that hinder or prevent me a good view. It promotes air circulation, which reduces moisture and mold. Harvest the tomatoes nodding the thickening between the tomatoes and the bunch. Thus, the crown remains on the fruit. To ripen the last fruit you can harvest the plant and hang her upside down. You can also have mature specimens ripen on newspaper on the window sill (inside). Still green tomatoes can be processed into chutney. If they have a little color they ripen (also picked) further if you keep them with mature specimens (or other mature, ethylene releasing fruits like banana). Rotation every 4 years avoids cork root disease and nematode infestation. There is no treatment for cork root disease. The cork root fungus (Pyrenochaeta lycopersici) can easily remain in the ground, and every year when tomatoes (or other nightshade e.g. peppers or eggplant) in the greenhouse are planted become stronger. The fungus will affect the young roots and cause brown, sunken spots and corky lines. Check the roots when harvesting. They should be light yellow or beige, without spots, bulges or cracks. Coeur de Boeuf or bullock's heart refers to the abnormal fruit shape, knobby ribbed like a tuber garlic cloves. The grow habit is sad: the leaves hang down, collored as with magnesium and chronic water shortage. And the cigar-shaped leaves curl up. The tomato contains little water, and so much fruit flesh. This fruit colors from the inside to the outside. The cherry tomato (Solanum lycopersicum var. Cerasiforme) owes its name to its dimensions. It consists of red, yellow, green, orange, creamy white or almost black, spicy, fruity or just sweet fruits. It is used as a garnish or as a raw snack, possibly with a dipping sauce. Plum tomatoes, also called Roma Tomatoes or Pomodori are oblong, oval tomatoes with fairly dry pulp that exist in mini or snack shape. In large greenhouses, the stems are obliquely rotated around unreeling ropes that are each offset. As a result, the ripe fruits hang slanted and lower at an easy picking height. At the end of the row are two poles around which the stems are tucked to the other side.